Cash for Junk Cars in Atlanta GA. Instant Quote, Paid in 24-48 Hours! 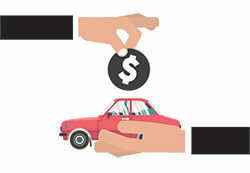 Get paid top dollar when you sell your junk car in Atlanta. We’ll pay you on the spot when we tow your car for free. Atlanta may be a big city, but it's expansive enough that you really do need a functional car to survive here. If you have a car that's seen better days, you may be having trouble finding someone to take it off your hands. This is because most private buyers don't want to invest the time or money into fixing up a car and because local dealers aren't experienced enough to properly appraise a car. Even junkyards will only appraise the car for scrap metal value! But DamagedCars.com are experts when it comes to buying and evaluating damaged cars — whether they're running or not. Damagedcars.com streamlines the entire buying process for our customers. We buy cars online, so owner's don't even have to leave their homes. It's our goal to give customers the ultimate in convenience from start to finish, which is why we offer free towing nationwide. So if your car happened to break down at your office, we'll be happy to come tow it away straight from there. And we act fast so you don't have to — our usual turnaround time for vehicle pickup is between 24 – 48 hours. We buy junk cars of most makes and models of vehicles, regardless of the condition they happen to be in. But we specialize in purchasing and evaluating damaged or salvage cars. You will officially need the keys and title in order to sell your vehicle to DamagedCars.com. Owners may need to take the license plates off the car before pick up. Before we give you an offer, we look at all angles of the vehicle you want to trade in. From the make and model to the condition of the car, we look at the whole car. Our evaluation process is the key to getting you get the best possible offer on your vehicle. Values may depend on the year of the model as well as the location of the pickup. We give you the fair-market value as opposed to a dealer's guess or a junkyard's low-ball answer. DamagedCars.com works hard at pleasing their customers, which is just one of the reasons why we enjoy an excellent reputation both online and off. People trust us because we aim to create a win-win for everyone. Our customers get paid, and we get to extract every ounce of potential from a car that may have just ended up in a junkyard in Atlanta. We're also members of Automotive Recycling Association and United Recycling Group. As the top junk car buyers in Atlanta, we know that giving back is just as important as paying it forward. We're not the only organization in the US to think outside the box when it comes to how we do business. In the 1980s, Atlanta Falcons coach Jim Hanifan left a stick of dynamite in the locker room of the players. They were even encouraged to walk up and touch it. He was trying to tell the football stars to explode with every play, and it definitely made an impression on the team. It may not have worked, but it's a testament to the passion of the city. We buy junk cars in Atlanta and all over the nation. We work with your desired pick-up location, wherever you happen to be. It's our goal to make the process as painless as possible, so you can purchase a new vehicle that works for you. So the next time you search 'sell my car in Atlanta' think of DamagedCars.com first! What should you know before selling to a junkyard or private buyers in Atlanta?